Feel as though your strengths lie in working with people? Interested in the functionality of the workforce and how it impacts on business? Well a career within human resources might just be for you. It might be a cliché, but employees are the lifeblood of any successful business. Without them, a company cannot function. In return, employees need to be motivated, managed and guided effectively in order to fulfil their potential and work effectively for the business. We get asked how to get into HR frequently by our students, so we’ve put together our top tips in how to get a job in HR. 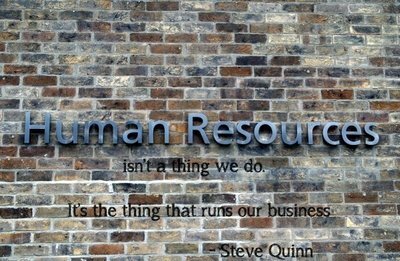 Human Resources is the process of finding, training, motivating and keeping employees productive. As such, it is the core of any successful business and will influence almost every facet of a company. By entering into a career in Human Resources, you’ll open the doors to a wide range of opportunities and progression in a growing profession. Under the Human Resources umbrella there are several careers that often work within the same department in a company but have very different roles. These are human resource manager, recruitment consultant, trainer and business partner. Quite often people start in recruitment or training and move into human resources or being a business partner. So how do you get started in HR? Well, aside from being motivated, working well with others and being adaptable, most HR positions will expect you to hold a degree in a related field such as Management. If you haven’t got the required qualifications, landing the big job can be a much harder affair, so it’s worth investing time in earning your qualifications. If you’ve previously studied at A Level, then you’ll be able to apply for a university place through UCAS. If you haven’t then you may wish to consider studying part time to earn your A Levels before applying. Another option, especially if you’re already employed is to study for a higher level qualification, such as a BTEC HND – which allows you to gain a high level qualification whilst building up practical experience in the workplace. As a bonus, on completion many universities will allow you to start a degree course in the 2nd or 3rd year, allowing you to fast track your career change. To start out in a HR team you don’t need any specific qualifications other than good communication and literacy skills. However a course in human resources, knowledge of law and or management of people will all stand you in good stead. To further your career as a human resource manager, though, you will eventually need a CIPD qualification. This is the Chartered Institute of Personnel and Development (Cipd.co.uk); it’s a professional association for human resource management professionals. To complete this course you usually need a related degree or experience in human resources or learning and development. When considering a career in HR, you’ll want to think about whether you’d prefer to be a generalist or specialist – both have their advantages. As a generalist you’ll oversee a wider range of duties, working across a range of projects and adapting to the needs of the moment. On the other hand, a specialist role will have you focusing on a specific field. Another consideration is your current level of experience. If you haven’t previously worked in HR, then you will find securing a job harder. If you have the opportunity to work as an intern or temporary staff, then you can gain valuable hands on experience. If you don’t have the chance, then you’ll need to think about how you can adapt your existing skills and experience to a HR role. You have to be an innately fair person when working within HR. Why? Because there are often times when difficult decisions have to be made and you must take the evidence before you and make a decision. Being able to empathise with people and know how to react, plus getting the best from different personality traits is incredibly important as an HR manager. Keeping abreast of employment law is imperative when being an HR manager. This could be changes in legislation or how the law is interpreted because of new case law. Documentation is very important when being part of an HR team, this includes personnel files, clear and concise documentation of any procedures and ensuring there’s a paper trail of any communication. Like our piece on how to get into HR and looking to take the next step? Get started today with our online course in human resources.